Surat, April 26: Tapping the potential markets, eZee Technosys is organizing events pan-India and in Indian sub-continent. The aim is to become one of the choicest hospitality solutions provider in the industry. Supported in 50+ languages, eZee’s hospitality solutions are used by 10,000+ happy clients in more than 160 countries. 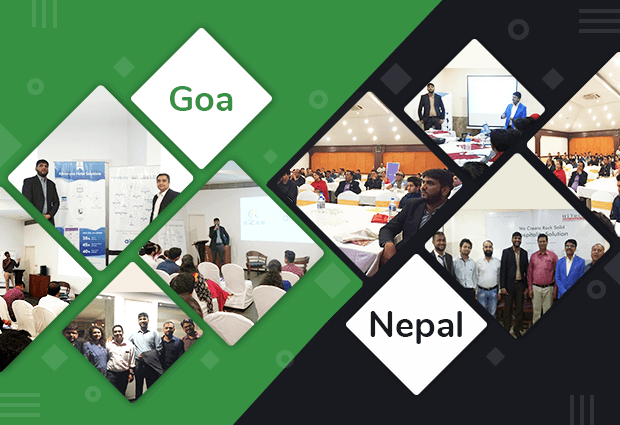 To empower hospitality industry with technology in Nepal, eZee and Hitech Solutions Services Pvt Ltd jointly organized 2 events consecutively on 7th April at Buddha Maya Hotel, Lumbini and on 9th April at Hotel Barahi, Pokhara. The event explained the role of eZee’s software technology in the hospitality industry and how it can increase the productivity of hotels and overall revenue. Director of Hitech and eZee Partner – Sanjay Singhania launched eZee’s hospitality solutions for the Nepal hoteliers. He presented how eZee solutions can benefit the industry and what type of hotel operations can be automated using the solutions. Attending the event eZee’s CEO Aeijaz Sodawala expressed delight over high turnout of hoteliers and a positive response for adopting eZee’s technology for their hotel automation processes. More than 150 hoteliers took the benefit of these power-packed sessions. The events culminated with casual interaction, exchange of thoughts between hoteliers, eZee and Hitech. In collaboration with Airpay, a famous payment gateway company, eZee organized the event on March 21. The hoteliers had a good time learning how technology can help in their business growth. Regional Manager – eZee Goa, Niral Ramani put forth a presentation on the topic: How technology can help hoteliers increase business. Airpay’s AGM Niket Mishra expressed substantial points on how digital payments boost the hoteliers’ businesses. eZee’s CEO Aeijaz Sodawala interacted with the hoteliers and encouraged them to share their experiences. The Fortune Hotel Group’s Managing Director – Joseph Britto took the stage for a panel discussion and explained the use of PMS, booking engine, channel manager and benefits of it in a hotelier’s life. He put forth some mind-boggling examples and convincing answers for embracing technology. The event was highly engaging as many active hoteliers shared their valuable experiences. In short, we came to know our users’ perspectives which were majorly positive. In total 50 hoteliers attended the event and benefited from a power-packed interaction. Finally, with a dinner and cocktail, the chapter of eZee-Airpay event was graciously wrapped up. We thank hoteliers for their active participation and making both the events in Nepal and Goa a huge success. More events are planned across the globe to build a strong rapport and develop goodwill among hoteliers. Remain in contact with us to be updated on such events.